On January 26, I wrote about the importance of great partners when building a campaign or brandscape. I was encouraged to see a group of brands aligned to literally rebuild a community in an authentic manner, while also finding a way to help themselves. ABC’s Extreme Home Makeover, along with Crate & Barrel, The Land of Nod, and the Red Cross, worked to rebuild the homes of people impacted by the catastrophic tornado that ravaged the town of Joplin, killing approximately 160 people and destroying nearly 8,000 houses back in May 2011. In addition to rebuilding 7 homes in 7 days, the team put in a playground and a memorial, and CVS even donated survival kits should this ever happen again. 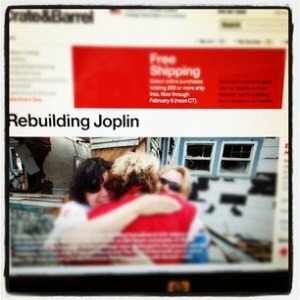 On the Crate & Barrel website, it is clear that they not only support the Joplin cause and have dedicated quite a few of their pages to the effort, but they also are capitalizing on the commerce aspect of the partnership. Sure, they can donate product to the families in need, but if someone else likes the decorating, why not make it easy to purchase? It would be great to build a case study about this so that other communities or charities or brands could know what it means to rebuild after devastation and could use this as a learning opportunity. On the makeover pages, Crate & Barrel has call-outs on their products — click on them and consumers see more detail and pricing for the selected item. This does not mean that their charity efforts are simply to benefit their own top line, but rather shows that they can authentically align charity and commerce. As encouraged as I am to see these complimentary partners working together, I would have loved to better understand the metrics and numbers involved. It would have been great to partner up with IBM (already a Red Cross supporter) to create some compelling stats about the campaign, similar to this. 13000 volunteers were needed for the Joplin endeavor. How much money or product was donated by the partners? How much was donated by manpower? How much was raised? How much was needed? It would be great to build a case study about this so that other communities or charities or brands could know what it means to rebuild after devastation and could use this as a learning opportunity.